This course follows the complex production processes associated with using pre-preg materials, by breaking them down into simple progressive steps. It covers a wide range of materials, processing methods and application techniques applied solely to pre-preg laminates. 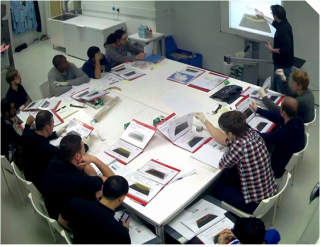 This is considered the foundation course for all personnel involved with processing pre preg materials, including pre preg laminators, technicians, supervisors, engineers, designers, researchers and managers. It is widely used across a range of industry sectors including Aerospace & Space, Formula 1 & Motorsport, Marine, Military and Sporting goods. No previous experience is required to attend this course, although Pre-preg laminating is widely considered a modern 'craft' skill that requires personnel to be ‘patient and methodical’ in their approach to practical work. Delegates who have fine craft skills, fine craft based hobbies, enjoy solving technical problems, are technically minded, good with their hands etc. often succeed with pre-preg materials. During the week we cover approximately 26 hours of practical tasks and 14 hours of theory and technical demonstrations. You will complete 4 practical tasks, 3 training tasks and 1 assessment task in total, which get progressively more technical throughout the week. All of the practical tasks will complement the theory, with technical demonstrations showing new skills. Each task adds to the technical detail of the previous one, allowing you to build confidence and skills throughout the week. The course covers all the elements associated with pre-preg laminating. Some of the theory we will cover includes the importance of laminate ply orientations and balanced layups, pre preg material handling and storage, composite tooling care and preparation, temperature & pressure profiles, inspection, delamination and fault identification. Beginning with material identification (fibre and fabric types) you will learn to drape pre preg fabrics at different orientations. Following layout manuals you will template parts, ply dropping the materials and looking in detail at staggered ply joins. Laminating over a range of mould features will give you hands on experience of nett edges, joggle details and return surfaces, including metal and composite inserts. During the technical demonstrations, each new skill will be shown with areas requiring special attention being highlighted. All parts are vacuum bagged using a range of methods and techniques. You will start with surface bagging, moving onto envelope bagging and using varying combinations of vacuum bagging consumables. Components are cured using an oven and autoclave. Parts are then evaluated and discussed. By the end of the course you will have seen all the features and shapes found in the pre-preg laminating industry. Nobody can train a pre-preg laminator to be ‘skilled/competent’ within a week, it takes months of practice. What our course does provide is key training covering all the basic skills, knowledge and understanding. This will enable you to go into the working environment informed and able to start simple jobs under supervision, where skills can then be gained with practice, usually within 3-6 months. Assessments are also included in our courses (which show the achievement of an individual in a controlled environment). This gives employers a guide to your potential if you are looking for work with pre preg materials.